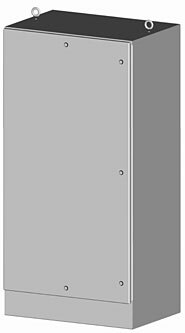 SCE-ELFS Series electrical enclosures are designed to house electrical and electronic controls, instruments and components. These electrical cabinets provides protection from dust, oil and water. For outdoor application a drip shield is recommended. ANSI-61 gray coating inside and out over phosphatized surfaces. Optional panels are powder coated white. Type 4 Free Standing Steel Enclosures. H 72" x W 30" x D 24"
Type 4 Free Standing Steel Enclosures. H 72" x W 36 " x D 24"